Delbert Crespin is a Santo Domingo artist who makes classic banded stripe disk bead necklaces and also makes elaborate mosaic inlay necklaces. His inlay work is "primitive" and meant to be evocative of early Santo Domingo creations. We've been buying this style necklace from Delbert since he first began making them. Each necklace is different but all have in common an extraordinary richness of color and pattern. 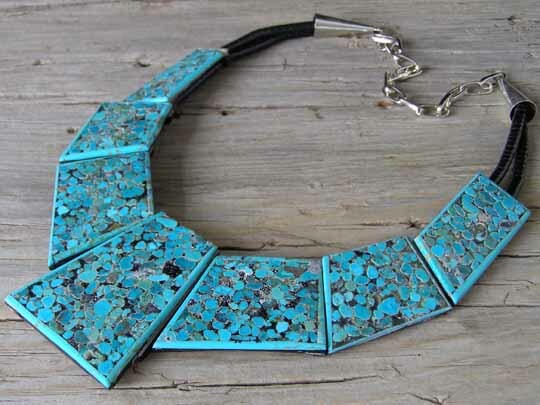 This necklace employs nuggets of Kingman turquoise which were sliced to be used as tiles while showing their rounded shape. These nuggets were then inlaid on the foundation and grouted with a jet paste matrix. The mosaic inlay work is done on a foundation of jet and these necklaces remain light and comfortable as they are made in a choker length. The necklace includes an extension chain to adjust the length and experimenting with the length by using the extension chain will result in finding exactly the right length which makes this necklace hang perfectly on your body. Before he began making this style of necklace, Delbert's most beautiful mosaic inlay work in necklaces was only available in longer and heavier necklaces. This allows someone who is not five feet ten inches or taller the opportunity to wear some of his finest mosaic work. In terms of the length, the measurement around the inside (shortest length) of the necklace is 16". Measuring around the outside perimeter of the necklace and the tip of the center plate is about 21". In addition, a 5-inch extension chain allows more freedom to adjust the length. Mosaic inlay plates: center 2 1/4" x 1 7/8"; (2) 2" x 1 1/4"; (2) 1 1/2" x 1 1/8"; (2) 1 7/8" x 7/8"